We want to help our patients enjoy whole and healthy smiles. This means addressing tooth loss and replacing missing teeth with a lifelike and long lasting dental implant. Can anyone receive a dental implant? 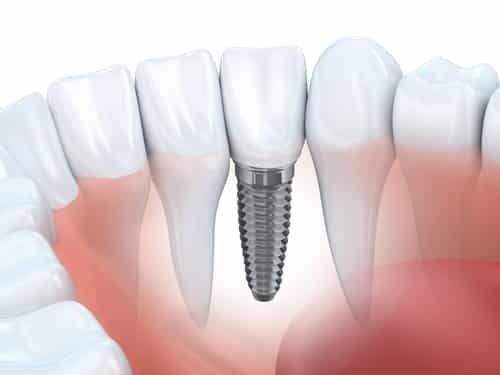 How do you place dental implants and how do you maintain them? Today, we’re looking at the process of placing new teeth. First, we will examine your smile to see if this is the best choice for you. If so, we will choose the area best suited for placement. An oral surgeon will place the implant post into the jawbone. At this point, we will need to wait for the area to heal to proceed. We look at a number of different factors, including the health of the gums (advanced gum disease can cause implant failure) as well as the strength of the jawbone. After all, you need to have enough jawbone tissue to support the new tooth. If not, you may need a bone grafting procedure before receiving a new tooth. The reason we wait three to four months for the area to heal is for osseointegration to take place. This process allows the dental implant and the bone tissue to bond, securing the new tooth like a natural root. With proper care and attention, you can then expect your new tooth to last a lifetime. The final step is to place a restoration. For a single tooth, this will be in the form of a custom-made dental crown. The crown looks natural and can withstand powerful bite forces. If you have any questions about receiving new teeth, then contact our office today. We look forward to helping you replace your missing teeth.